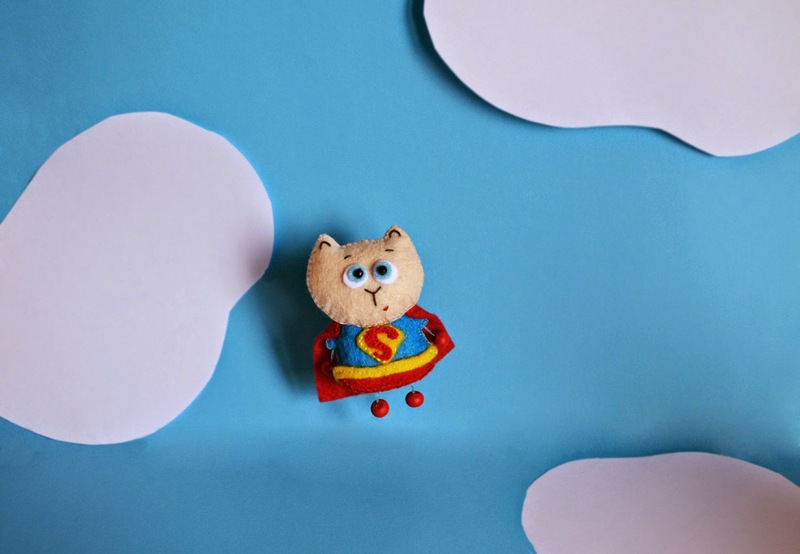 It's a bird... it's a plane... it's cats! I am what you would call a cat enthusiast. This is also sometimes known as being a crazy cat lady. I'm okay with this label. I embrace it - just like I want to embrace every feline that I encounter. I don't quite go full on Elmyra from Animaniacs, but it's close. I'm not quite as intense as her. Anyway, when I see merchandise featuring kitties I always have to stop and give it a second look. 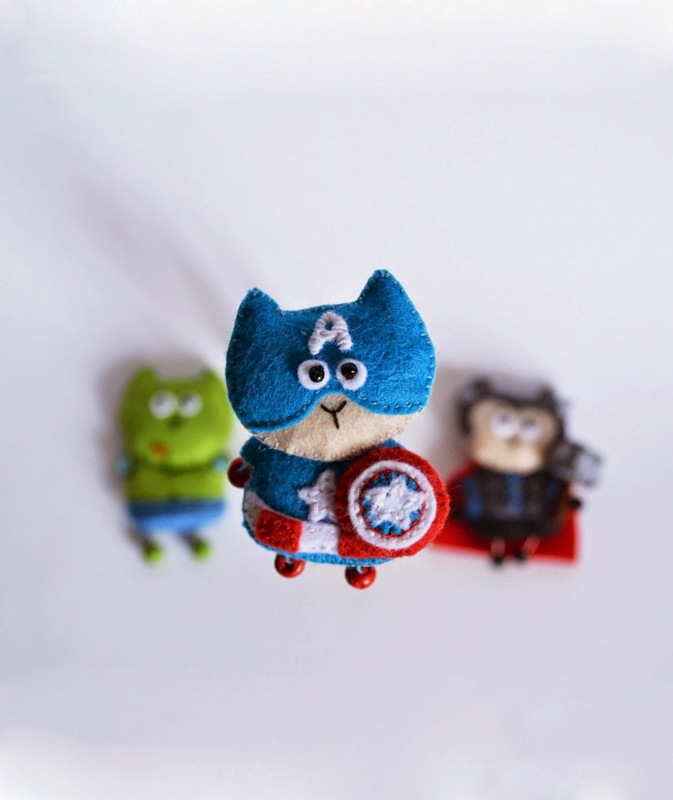 If said cat merchandise is mixed up with geeky franchises like these miniature superhero cat plushies by TuriTuturi? Forget about it. 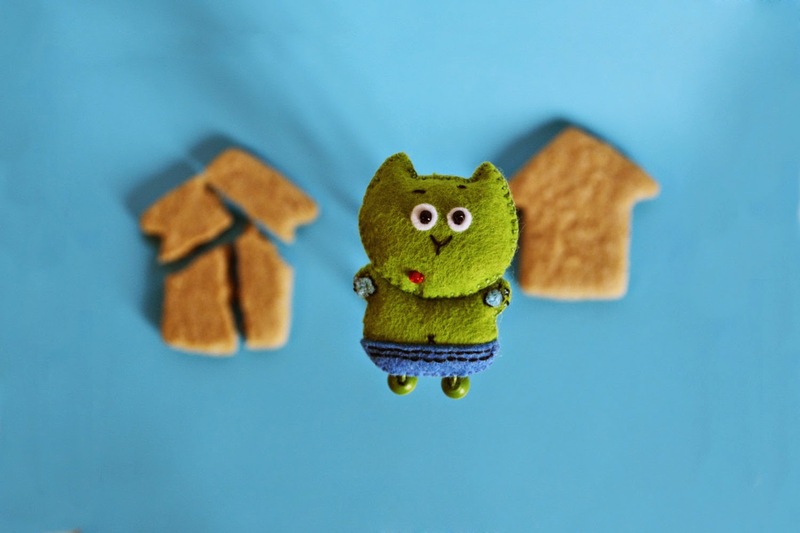 Shop for tiny felt superhero cats at Turi Tuturi on Etsy. And yes, they accept custom orders. I want to order an army of them and create the world's first cat superhero team. 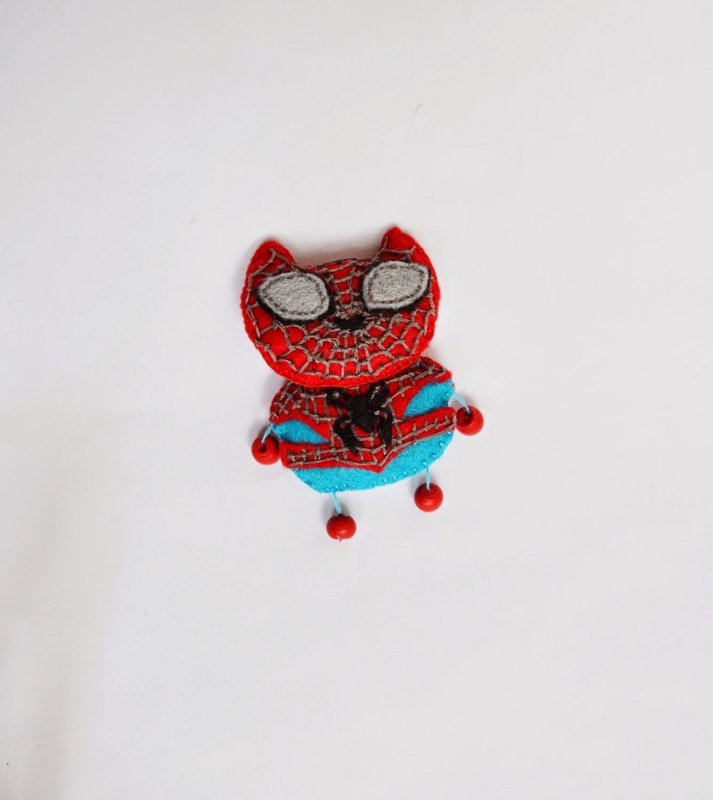 It would also probably be the world's last superhero cat team because as much as I love cats, they're easily distracted. They probably would forget what they were doing while in the middle of saving the day. My home is now 200% safer because Gamora is standing guard. I'm pretty sure the most dangerous woman in the galaxy could take down anyone who steps out of line with an intense glare, and the Gamora Sixth Scale Figure from Hot Toys has that. This figure practically radiates attitude. It's modeled after Zoe Saldana as the character in Guardians of the Galaxy and the likeness is so spot on that Sideshow Collectibles made a quiz that lets you guess whether a photo is the actual Zoe Saldana or the figure. Try taking it - choosing isn't as easy as you would think. Packaging: The outer box is so pretty. 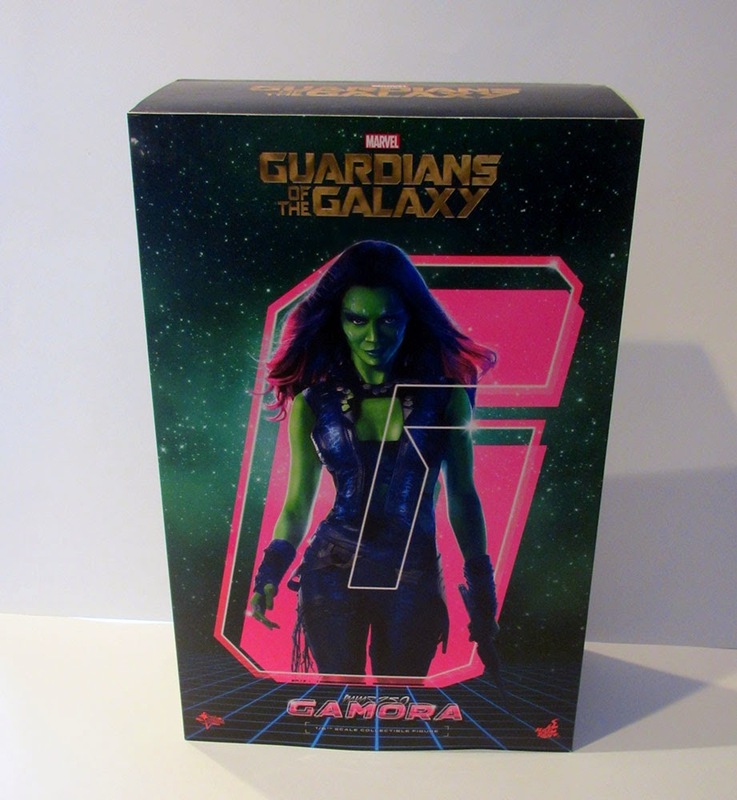 It features Gamora layered on top of a neon pink letter "G" and I want it on a t-shirt so badly. The sides of the box match the background of the police lineup in the movie. Once you get past the lovely outside, the figure is securely packaged in plastic. Everything has a place, and small pieces of plastic are over her hair (which is not sculpted!) and in between parts that might rub against each other and cause scuffs. Hot Toys is always very careful about that. Sculpt/likeness/paint: I've already touched on how much this figure looks like Zoe Saldana. It's uncanny and weirdly enough, pictures make the figure look more like her - whether you use a flash or not. The sculptors at Hot Toys continue to impress me by capturing a character's likeness and infusing a static sculpt with so much emotion. She looks fierce and you can amp that up by swapping out her hands so she can hold weapons. I really like how the joints work on this figure. The elbow joints aren't visible - and by that I mean the ball joint isn't bare. Instead, her arms are covered with a flexible material that makes them look natural whether they're straight or bent. Seamless! That's the word I'm going for. It's a small touch but I LOVE it. You can swap out her hands and those joints are covered by her wraps/bracers. That aspect of her costume works perfectly for this purpose. 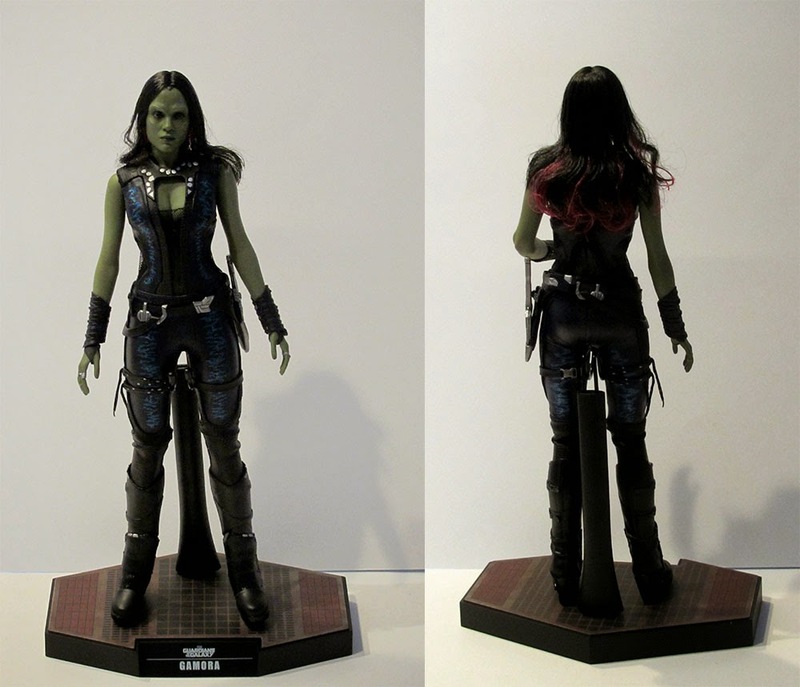 As I mentioned earlier, the Gamora figure comes with actual hair. It already comes with some product it in, but instructions state you can add gel to the hair in order to style it. It's black and pink just like in the movie. This is the first Hot Toys figure I've handled that doesn't have sculpted hair, and it makes a big difference. The texture is a little rough and the out of the box style isn't my favorite (I arranged with my hands in these pictures), but I bet if I used a fine tooth comb I could whip it into shape and make it look more tidy and lush. I'd much rather have actual faux hair (it's fabric hair) than sculpted stuff. This approach would have worked well for the Winter Soldier figure. 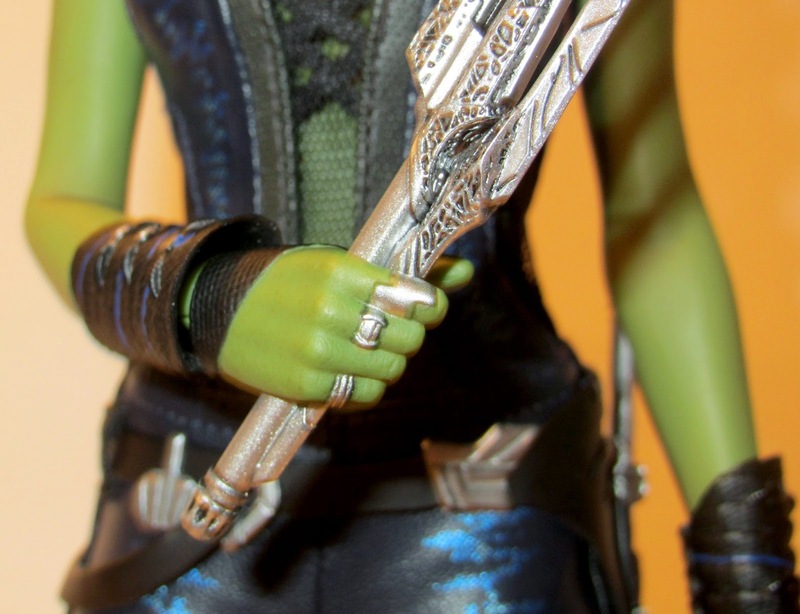 Clothes: I liked Gamora's outfit before but seeing it close-up, albeit in miniature, makes me want to cosplay as her. The fabric is stretchy enough to accommodate all kinds of poses - I bent every point of articulation I could find - but plenty sturdy. There are different textures to break up the black jumpsuit: metal studs are around the collar, there's the netting on the front of the top, chunky bracers, and holsters and belts. The holster on the right thigh slides down when you pose Gamora, but it can be moved back into place with no trouble. I adore the way the blue highlights on the jumpsuit look; there's some coordinating blue pieces in the bracers that I didn't notice until taking a closer look. The blue, black, and silver come together nicely. 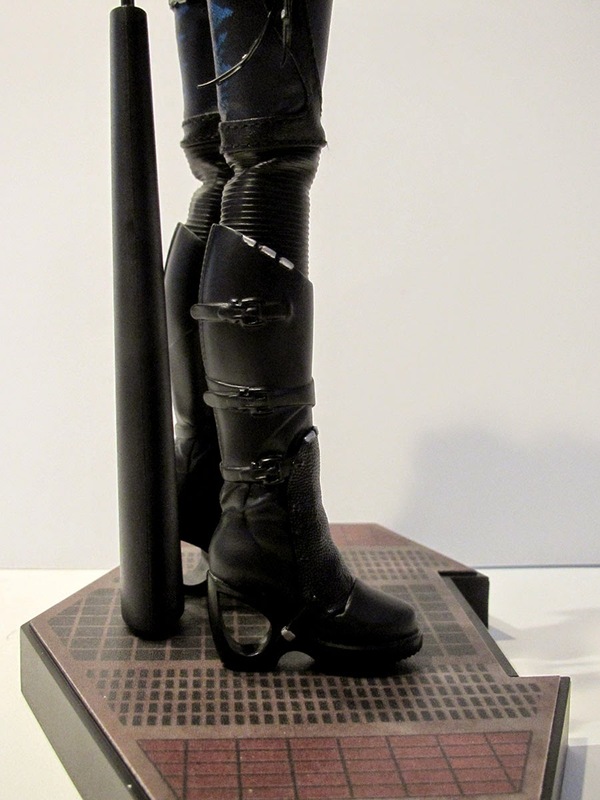 The boots don't look comfortable to me, but they do match what we see Gamora wear and they appear well made. 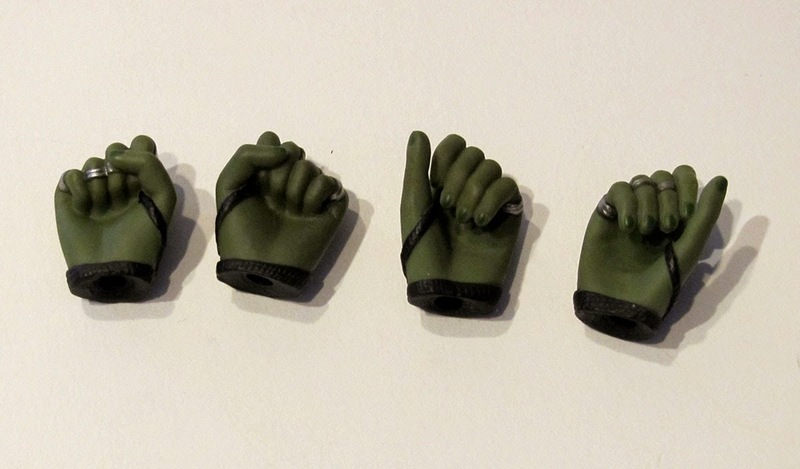 I appreciate how all the interchangeable hands are adorned with her many rings. It's all in the details, kids. Accessories: Gamora is not a character of many accessories. I would have liked to have another head with a different expression (maybe the raised eyebrow?) what's included with this figure is solid. She comes with three total pairs of hands that are easy to switch out, an extended sword, and a folded up one. 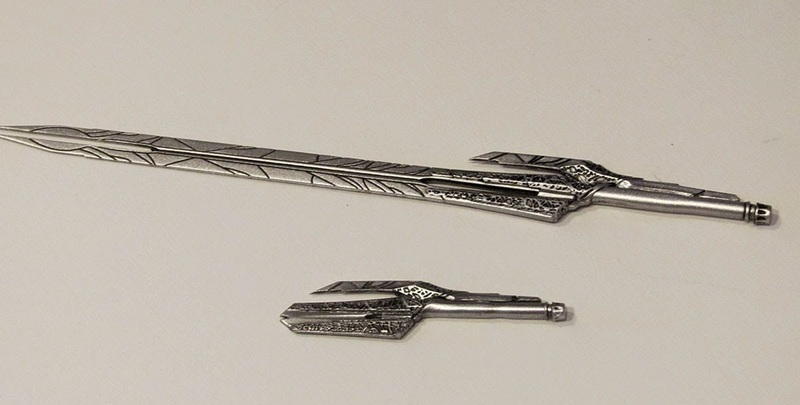 The folded sword snaps into her holster, and the extended sword can be used with a couple different hands. The swords are covered with engravings to match what we see on screen. 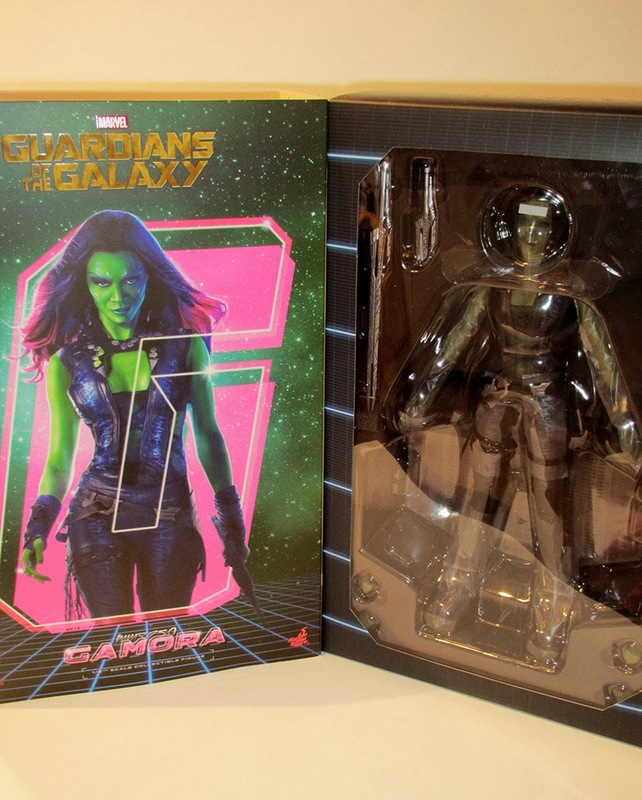 Gamora also comes with a stand. That's the only part of the figure I didn't love. Assembling the two pieces of the stand took some elbow grease, but it did snap together and served its purpose. Taking it apart again was no problem. 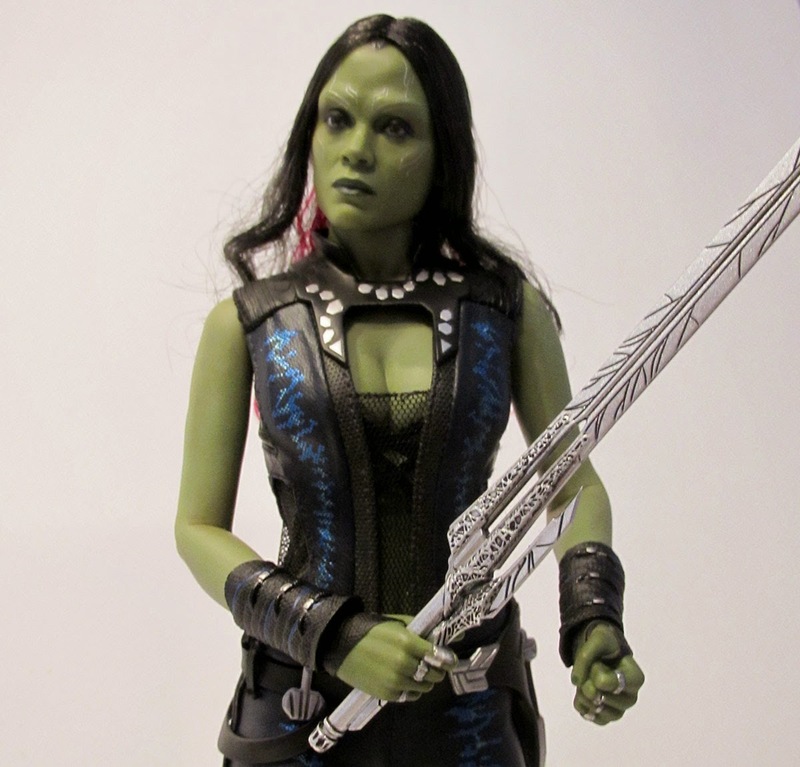 You can purchase a sixth scale Gamora at Sideshow Collectibles for $199.99. If that's too much at once, you can break it up into a payment plan. The figure is currently expected to ship in April. Need to see more pictures of Gamora? I have some at Flickr, and Sideshow Collectibles has plenty of images that are much more beautifully lit and posed. Full disclosure: Gamora was provided by Sideshow Collectibles for review purposes. This did not affect my review of the product. Toy Fair is happening in New York, and there's been some disheartening news from Hasbro. Getting figures depicting female characters is an ongoing challenge, and that's especially true with Star Wars Rebels. Hera Syndulla and Sabine Wren are equal members of the primary cast in the animated series, yet they weren't part of the first wave of Rebels toys (that was a point of contention at last year's Toy Fair) and even now there's only a single Hera figure and a single Sabine figure. Nevermind that multiple versions of figures have already been released for Ezra, Kanan, and the Inquisitor. PLENTY? TWO figures is PLENTY?! I am so disappointed and frustrated by this statement. And insulted. And let's back up to look at the representation of figures for Ahsoka Tano and Padmé Amidala. Yes, I counted. As of 2012, Hasbro had released 7 3.75" Ahsoka Tano figures as compared to 14 of Anakin Skywalker and 13 of Obi-Wan Kenobi. They released 26 Padmé Amidala figures as compared to 61 for Anakin Skywalker and 58 for Obi-Wan Kenobi. 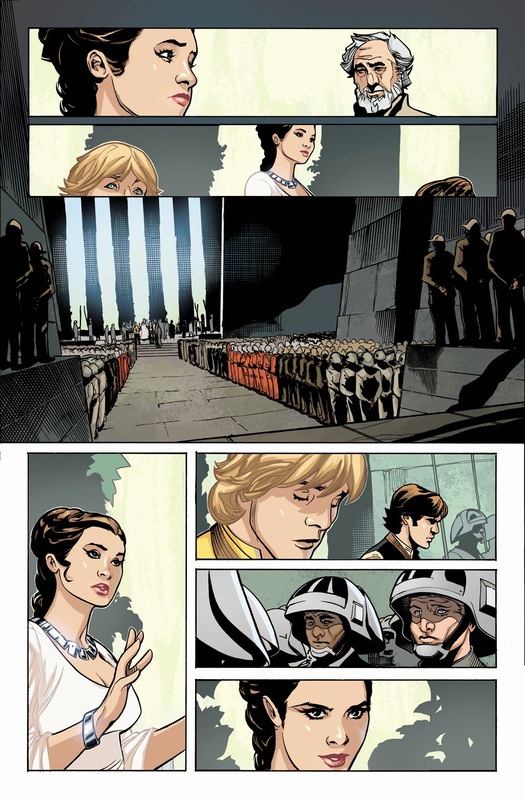 Both Ahsoka and Padmé were primary, lead characters. Does "plenty" mean all we can hope for is half or less than half of the figures made for male characters? 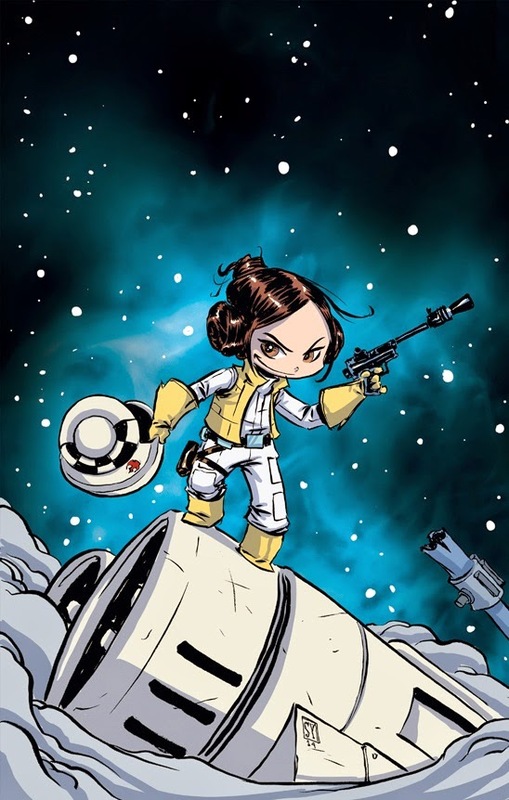 Thanks, Hasbro, for making me feel like female fans and female characters don't matter to you... again. "Hasbro actually has some great new characters from Rebels hitting shelves now such as Sabine and Hera and have recently been releasing more females within our Black Series and Saga Legends line such as Mara Jade, Toryn Farr, Bastila Shan, Luminara Unduli, Padma Amidala (Geonosis), and a number of great Leia’s such as Ep IV, Endor, and the awesome Boushh disguise that was revealed at NYCC." UPDATE #2, 2/18/15: Hasbro reached out to me to let me know the interview posted by Jedi Temple Archives was not recorded and that what Jedi Temple Archives posted was paraphrased. Huh. I can almost hear them backpedaling. 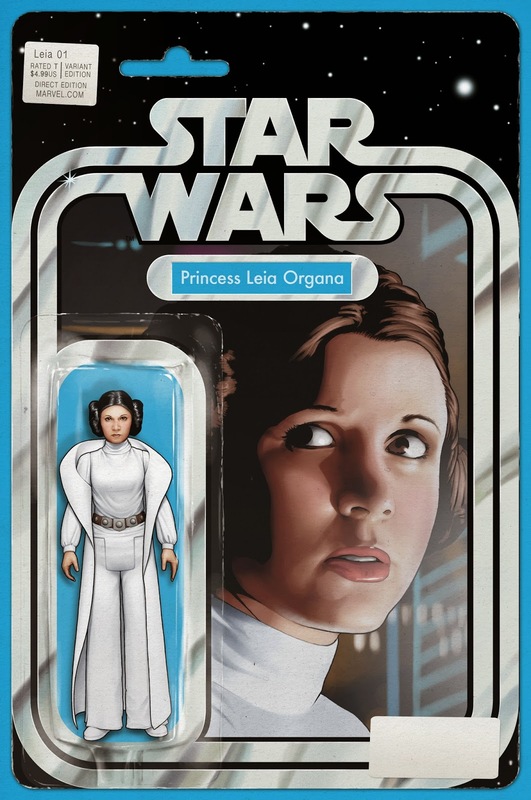 Also Hasbro, it's Padmé not Padma. Valentine's Day is almost here! 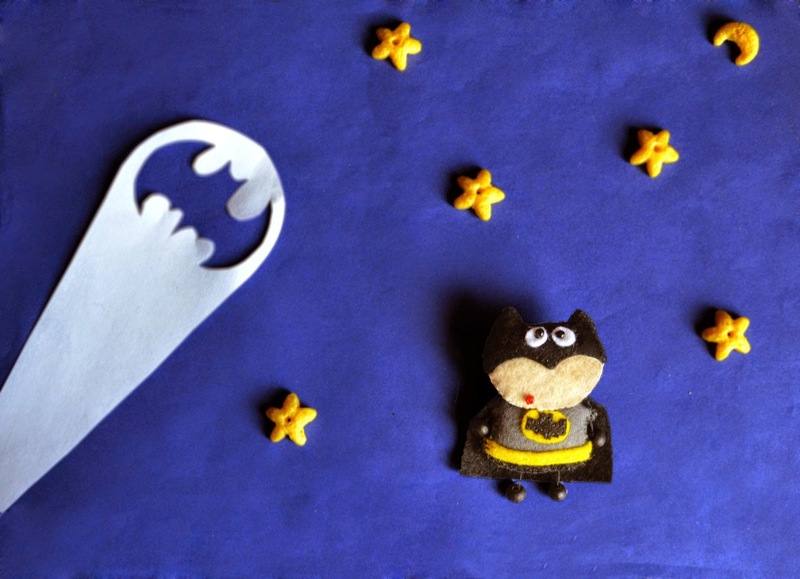 While I don't really celebrate the holiday or even pay much attention to it, I do like the idea of themed treats. If I come across heart-shaped anything on Saturday, I likely won't turn my nose up at it. In fact, I'm considering making these delicious looking Wookiee Cookies by justJENN. The brown sugar cookies are decorated with chocolate frosting, brown sprinkles, and little tiny hearts. If Chewbacca could bake without getting his fur into everything, I bet he'd make a batch of these cookies for Han Solo. 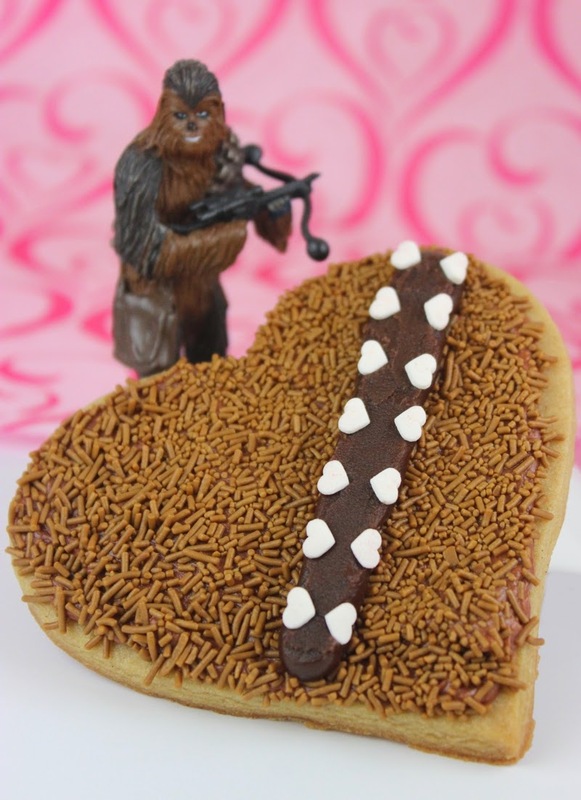 Get the recipe for heart-shaped Wookiee Cookies at Fandango. Not into Wookiees? Jenn has a recipe for heart-shaped Death Star cookies up at Nerdist. Happy baking! 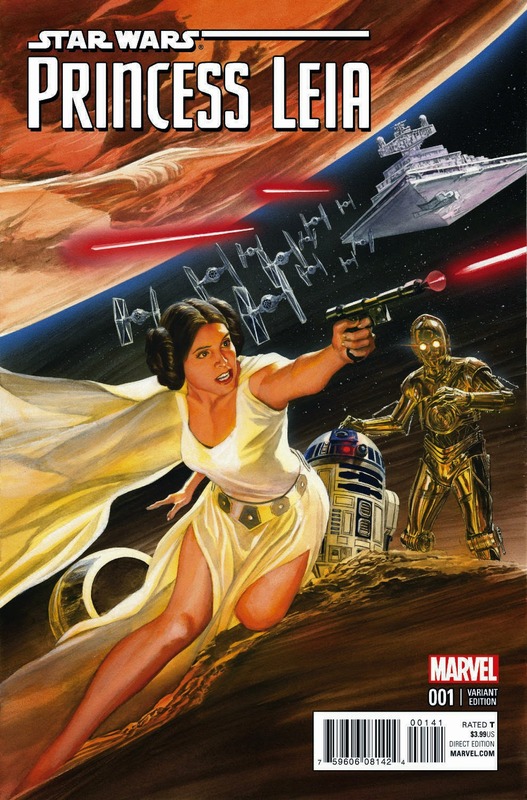 Marvel's Princess Leia #1 will be here on March 4, 2015. 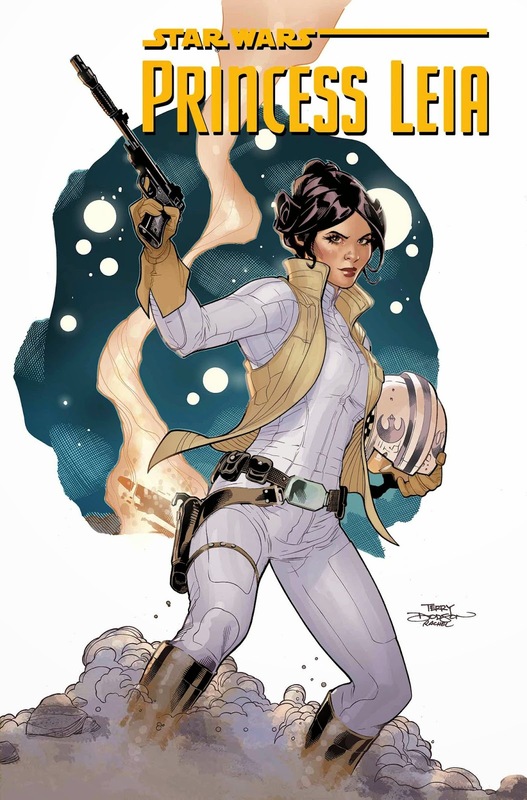 She's been present in many Star Wars comics of yore, but here, she's taking the spotlight. 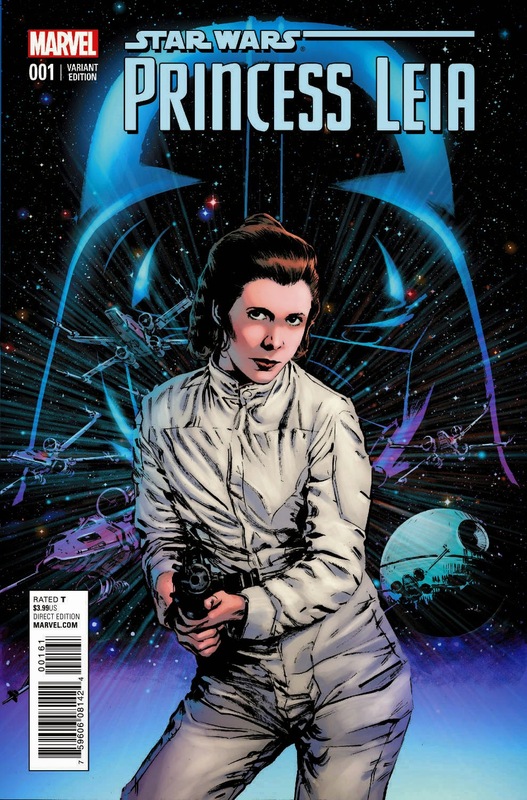 Writer Mark Waid and artist Terry Dodson will focus on Leia Organa between A New Hope and The Empire Strikes Back. 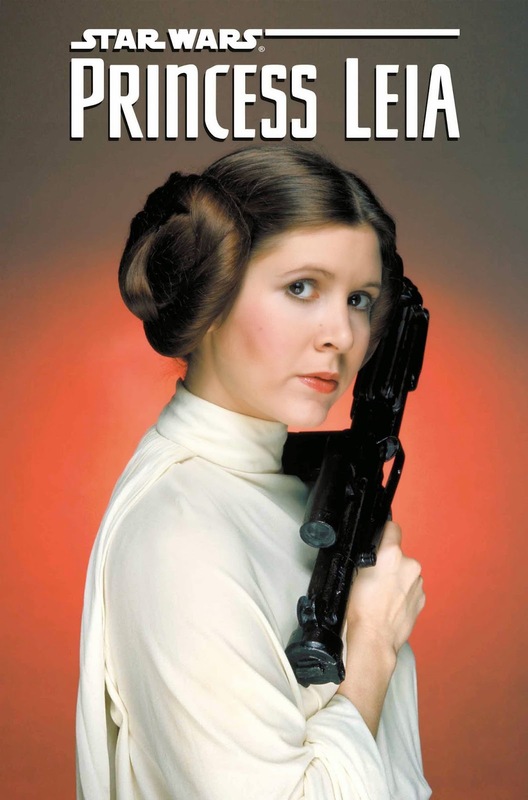 This is a women who is a leader in the Rebel Alliance but also lost her entire planet. Imagine losing your home, your culture, and everyone and everything you ever knew. 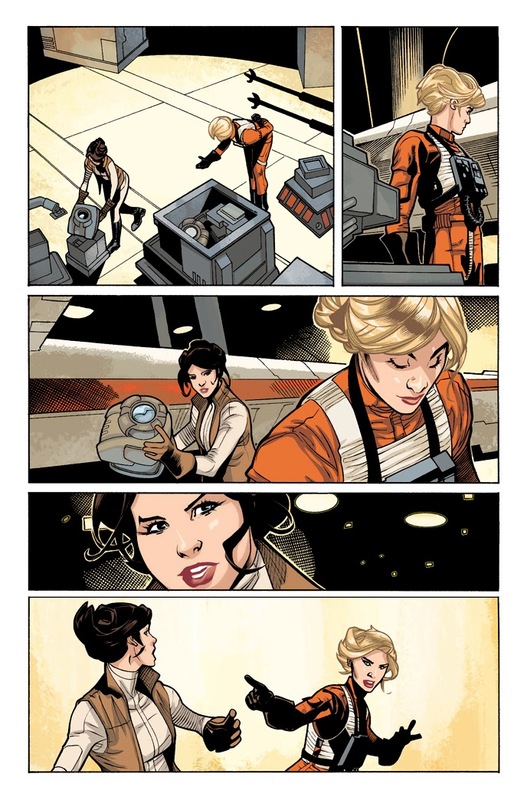 It's a crippling blow, yet Leia pushes forward. "...how does she really cope with losing her entire world once the events around that loss have calmed down somewhat? Does she choose to be the princess of nothing—or does she set out to rebuild her heritage and her civilization? You can probably guess the answer." And why not look at some interior pages before you go? 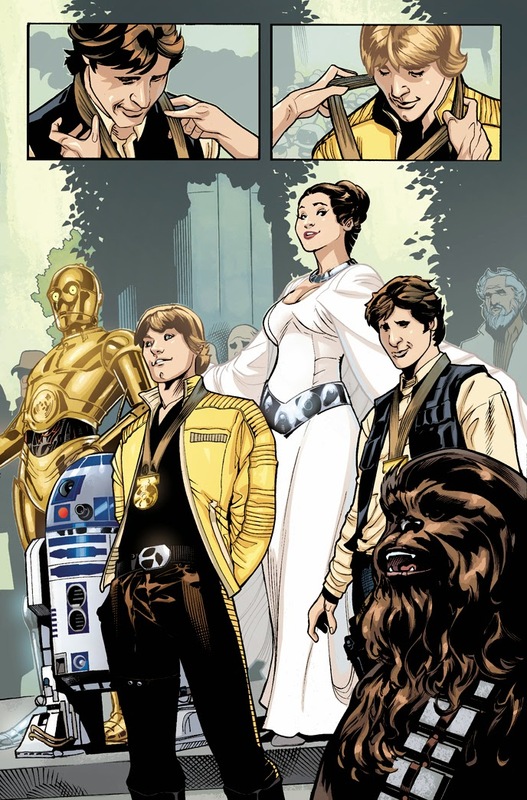 I barely have words to express how excited I am to read this comic. Marvel's Agent Carter has captured my heart in so many ways. Peggy Carter is indeed the superhero I've been waiting for, and besides her and Hayley Atwell's superb performance, I'm impressed by the dialogue, the characters, and that elegant 1940s setting. The styles of each character are distinct and stunning; costume designer Gigi Ottobre-Melton has done impressive work so far. I spoke with Melton for a new column at Nerdist titled Behind the Costumes, and we talked about the setting, the challenges, and the use of vintage clothing vs. making replica pieces. How about her memorable red hat? 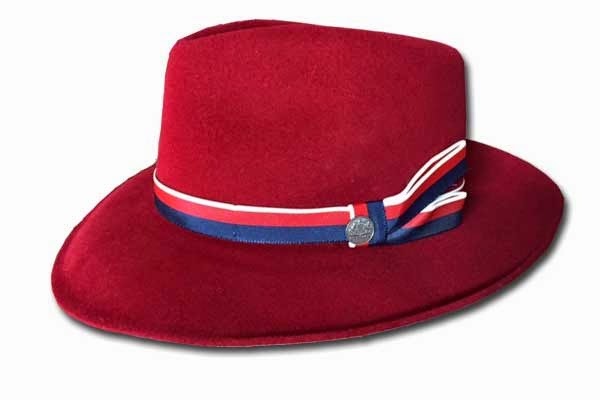 You can purchase a similar design from the Beau Chapeau hat shop for $89. 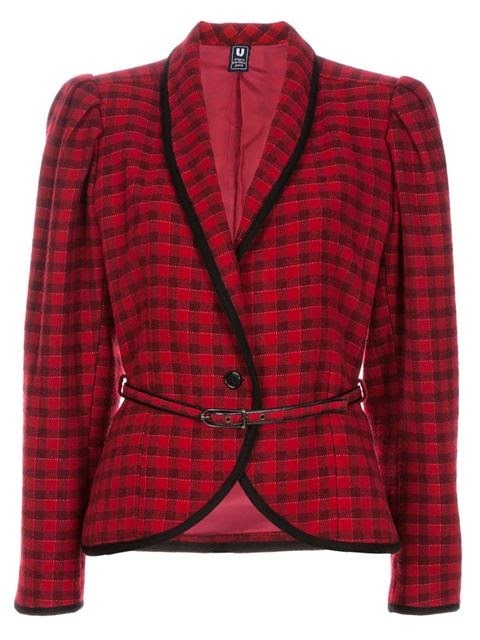 Peggy's rocked a couple of different plaid blazers - navy blue and red. I could go on and on. 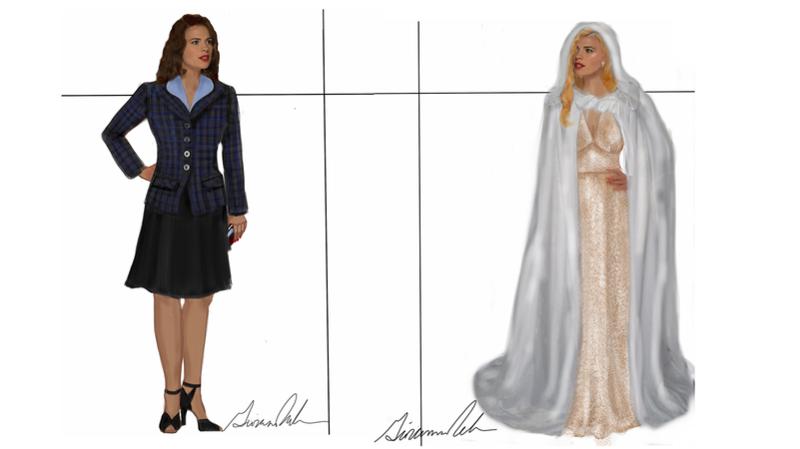 Which outfits of Peggy Carter's are your favorites? 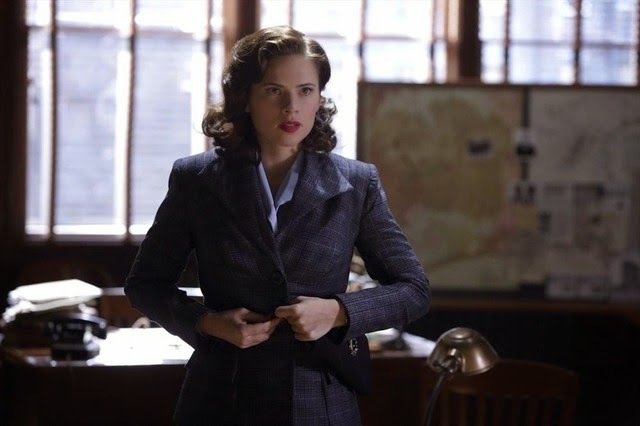 You can read my reviews of Agent Carter at Nerdist. Be sure to read ABC's posts each week as they discuss the fashion of each episode with Melton. While it is sometimes still a struggle to make manufacturers realize that female fans will indeed spend money on stuff - including toys - others are swinging into the curve. Five years ago, my best source for finding a nerdy t-shirt was to head to the boys' section at department and clothing stores. Honestly, that still happens but much less so than it used to. 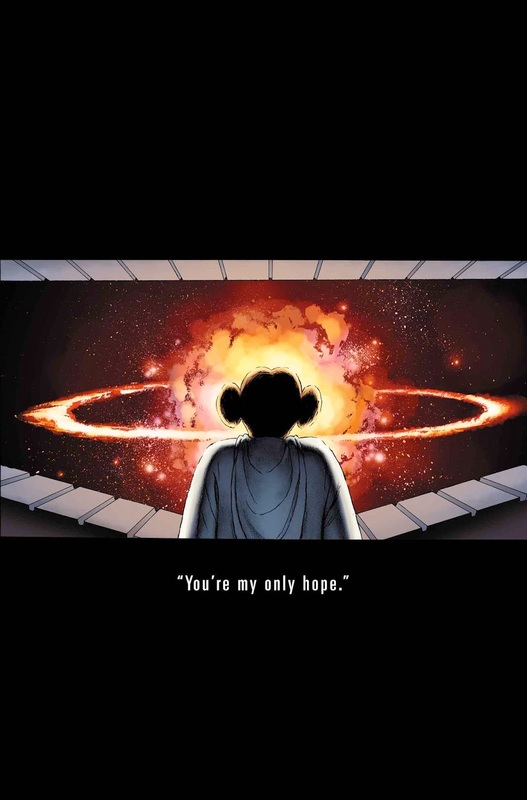 I believe we have Her Universe to thank for pushing over the first domino. Other companies have followed in their lead, including Hot Topic. 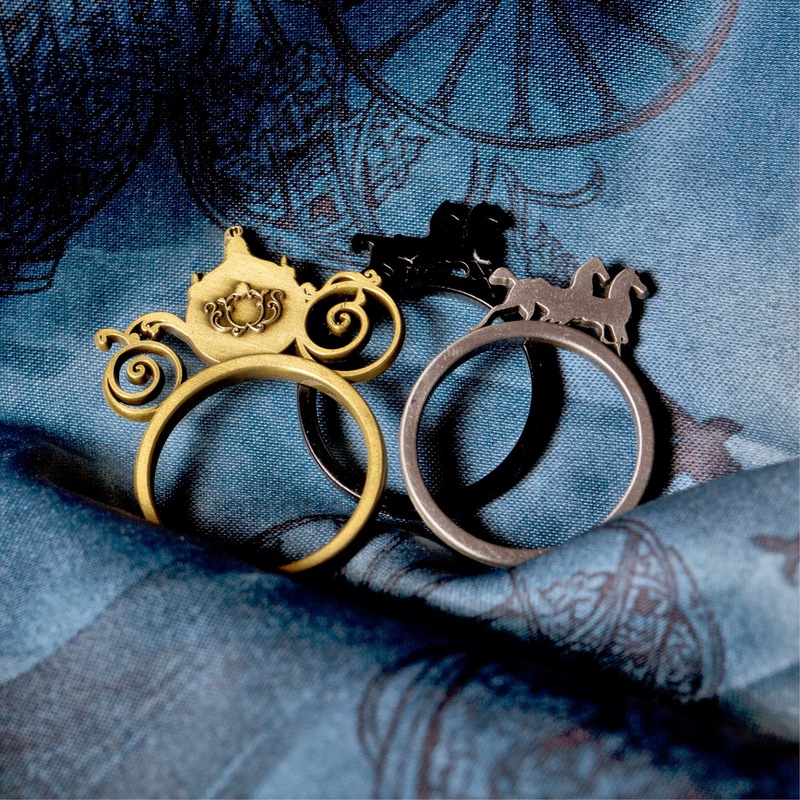 I can't get over the amount of cute, creative, and even chic Disney apparel and jewelry Hot Topic offer these days. They cover all sorts of other fandoms too - from Doctor Who to Supernatural. It's incredibly easy to fill up my cart with a stack of geeky goods. Hot Topic offers more than t-shirts when it comes to some of these franchises. 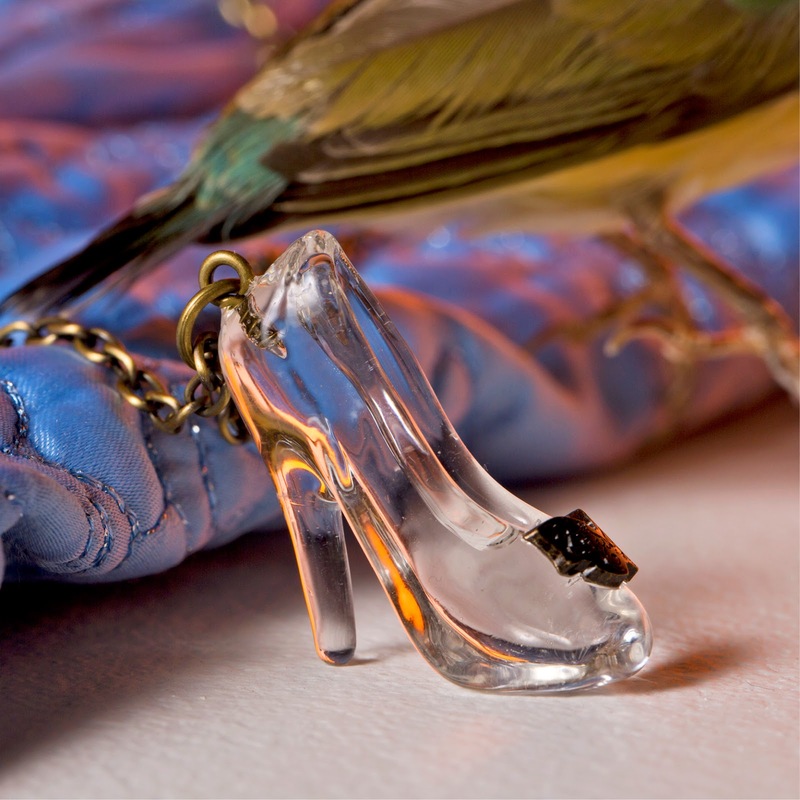 They created a fashion line to accompany the release of Disney's live-action Maleficent last spring, and they're doing the same with Cinderella. The entire Cinderella collection is available for pre-order now. And jewelry will be added soon! I like the way they've incorporated elements from the film into their designs without making the results look too much like cosplay. It's making me look forward to what they'll come up with for the live-action Beauty and the Beast! Cosplay is a rewarding hobby with a broad definition. You can build from scratch, go casual, or start with a premade base. 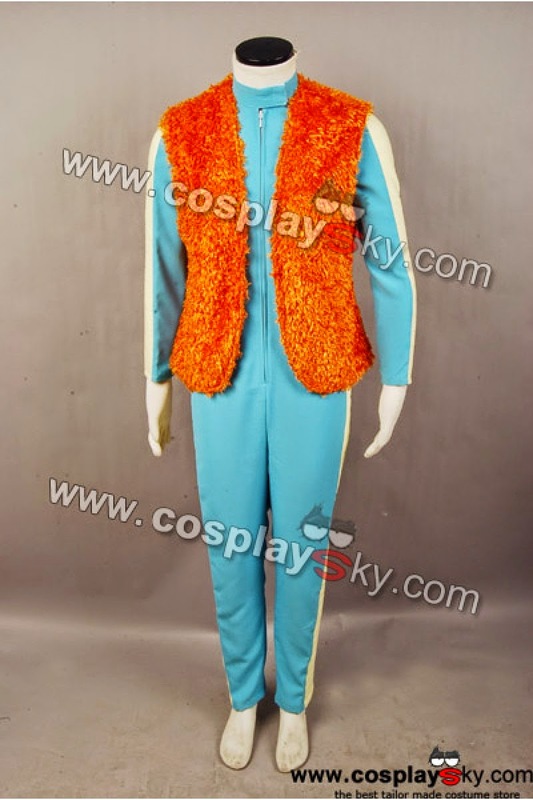 Cosplay Sky can help in two of those departments with their vast and varied selection of costumes - particularly in the Star Wars and Star Trek departments. 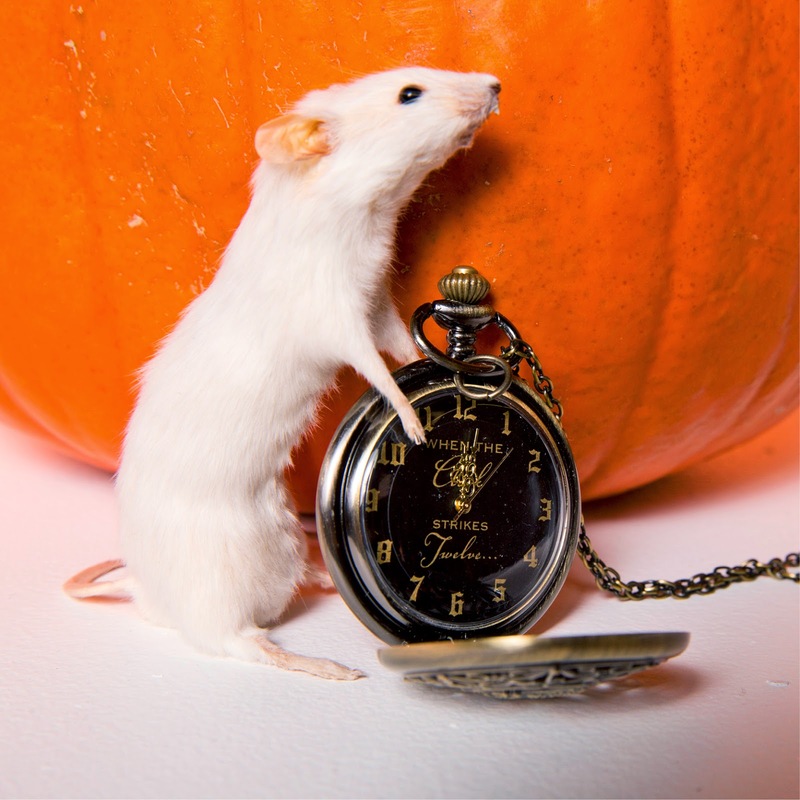 Though premade costumes aren't for everyone, there's no shame in wearing them outside of Halloween. 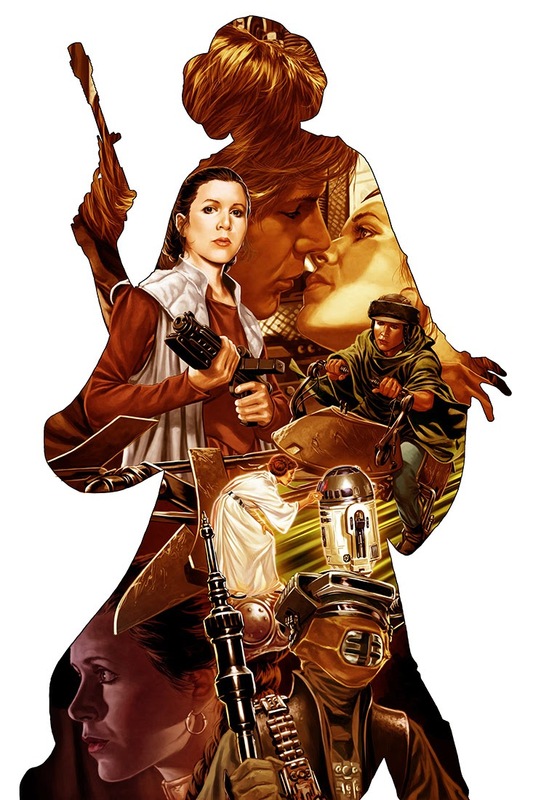 Convention season kicks off in high gear in spring, and the next Star Wars Celebration is happening in April. You can get prepared now by getting your order in at Cosplay Sky. Let's look at their offering of Star Wars costumes first. These aren't your average costumes. 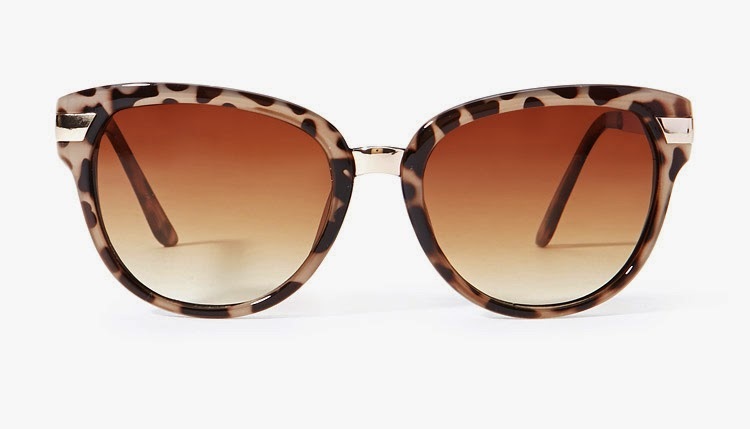 The outfits are made to order to fit the basic measurements you provide. You'll need to give them your size, height, weight, chest, waist, arm length, and inseam sizes to ensure the best fit possible. This is where a tailor's tape comes in handy (I keep one in my desk drawer and use it regularly). Cosplay Sky's Star Wars costumes include: Greedo, Darth Maul, Mace Windu, Luke Skywalker, Obi-Wan Kenobi, Darth Revan, Emperor's Royal Guard, and Han Solo among others. I mean, they have a Sheltay Retrac for goodness' sake. 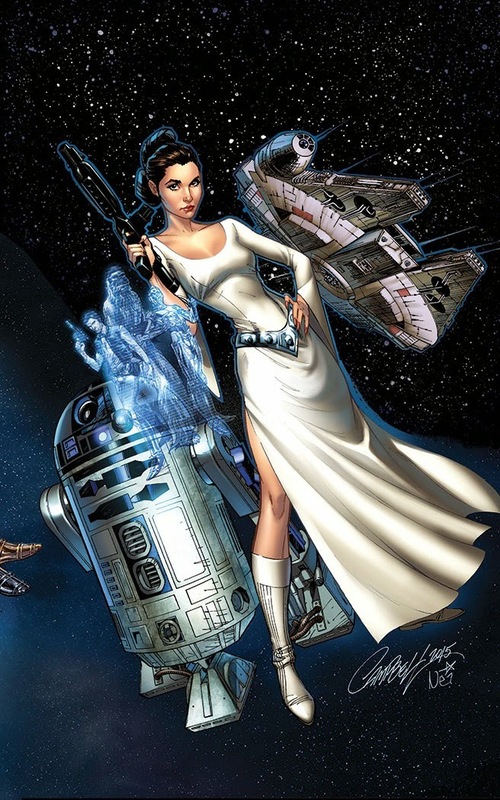 Given the appearance of that rare character, you may want to ask them about commissioning any of your favorite Star Wars characters from Legends or the movies and television series. I've got a Sabine Wren costume on my wish list! Star Wars costume pieces start at $30. 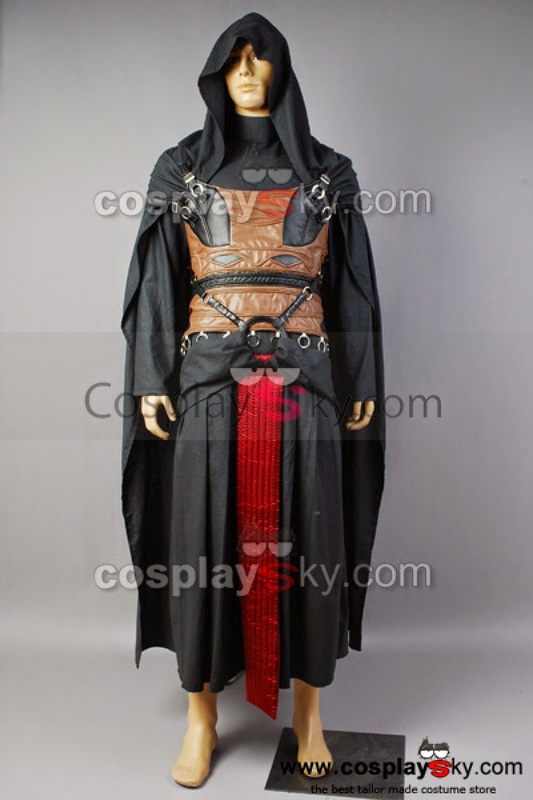 If you're not interested in a made-to-order costume, they also have robes and cosplay hoodies available. Switching sides to focus on Star Trek costumes, there are even more offerings! Cosplay Sky has costumes from the original trilogy to the new, rebooted films. 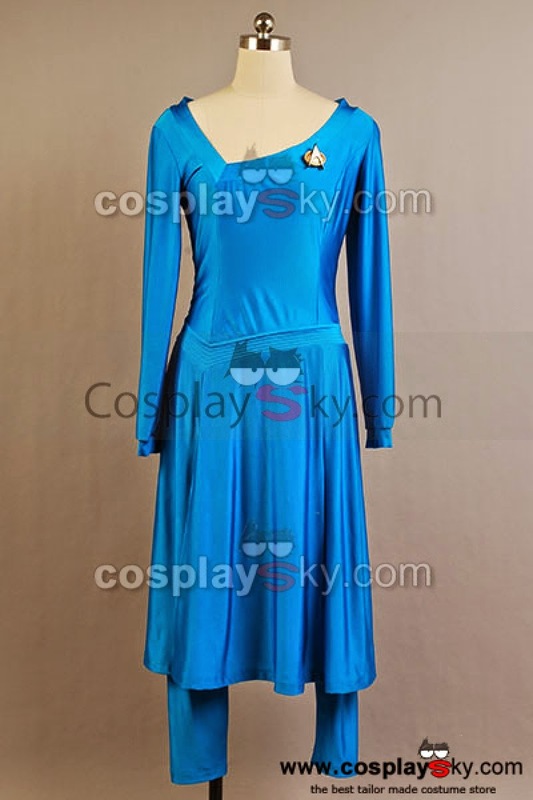 They have my favorite Deanna Troi look - the blue pant-dress with an asymmetrical neckline - and even the skant costume from Star Trek: The Next Generation. It's available in different colors! In case you don't remember, the skant is a dress with built in shorts and short sleeves. It was worn by men and women. Heck. Yes. 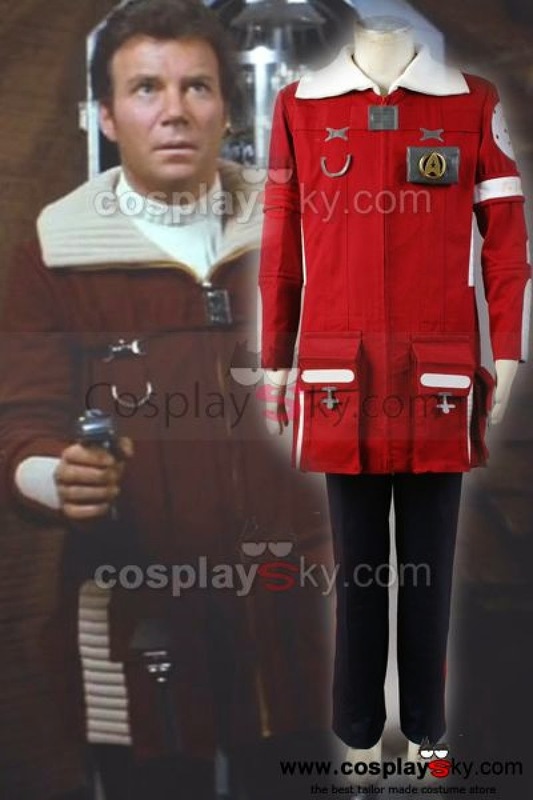 Besides the Troi dress and the skant, Cosplay Sky's other Star Trek costumes include: Admiral Kirk's Wrath of Khan ensembles, Spock's white robe from Star Trek IV: The Voyage Home, away jackets from Enterprise, Q's judge costume from The Next Generation, and standard uniforms from most of the Star Trek television series and films. Star Trek costume pieces start at $45. You can wear all these costumes for theme parties, conventions, marathons (yes, themed marathons are a thing),Star Trek or Star Wars watch-parties, or just around the house. No one will judge you for wearing costumes at home except your pets. As mentioned, the costumes are all handmade and as such, they'll take a little bit to get to you so plan ahead and order in plenty of time for your event or get in touch with Cosplay Sky about rushed shipping. Happy cosplaying!